The first in an occasional series of posts to help students prepare for aural tests. Understanding intervals is an important aspect of playing and studying music, and this is why music exams test candidates on their knowledge of intervals. 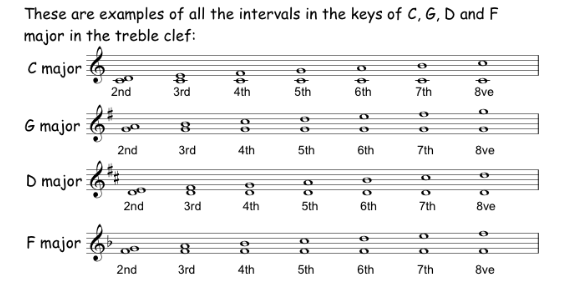 An interval is the distance between one note and another, and is always described as a number, depending on how many degrees (‘steps’) of the scale are between the two notes (see my post on Major Scales for more about the degrees of the scale). For example, from C to D is two steps, and this interval is a 2nd. Each interval sounds and looks different, and with practice, you will be able to spot them more easily when you hear them or see them written in the score. We always read up from the bottom or ‘root’ note: in the scale of C major, the root note is C.
Previous postGuest post: Transposition – a dying art?